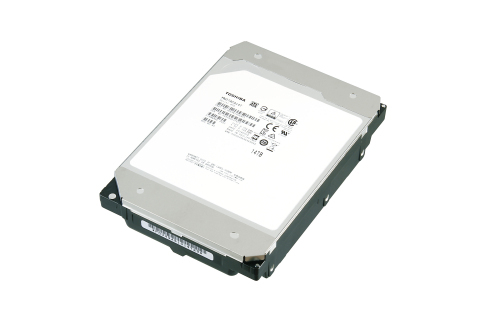 Toshiba Electronic Devices & Storage Corporation (“Toshiba”), a committed technology leader, announces the MN07 Series 12TB1 and 14TB 3.5-inch2 hard disk drives for use in NAS platforms. The Toshiba MN07 Series utilizes a helium-sealed mechanical design to achieve the massive 14TB and 12TB capacity. The 14TB model improves power efficiency by approximately 55 percent (W/GB3) over the previous 10TB “air” 7,200rpm mechanical designs. The MN07 Series is designed for use in NAS appliances with eight or more drive bays and is suitable for NAS file and object storage applications that require disk drives with workload ratings of up to 180TB per year4. The MN07 models feature vibration compensation technology and advanced Format (AF) 512e sector technology. Additionally, both devices offer 24/7 operability, superior reliability with MTTF5 of 1.0 Million hours, and are compatible with popular 3rd-party, 3.5-inch NAS enclosures. For more information on Toshiba’s full line of HDD storage products, please visit: https://toshiba.semicon-storage.com/ap-en/product/storage-products/client-hdd.html and follow @ToshibaSemi_EN on Twitter. 1 Definition of capacity: Toshiba defines a megabyte (MB) as 1,000,000 bytes, a gigabyte (GB) as 1,000,000,000 bytes and a terabyte (TB) as 1,000,000,000,000 bytes. A computer operating system, however, reports storage capacity using powers of 2 for the definition of 1GB = 230 = 1,073,741,824 bytes and therefore shows less storage capacity. Available storage capacity (including examples of various media files) will vary based on file size, formatting, settings, software and operating system, such as Microsoft Operating System and/or pre-installed software applications, or media content. Actual formatted capacity may vary. 2 Form Factor: "3.5-inch" means the form factor of HDDs or SSDs. They do not indicate drive's physical size. 3 Power efficiency is calculated based on active idle power consumption divided by formatted capacity. 4 Workload is a measure of the data throughput of the year, and it is defined as the amount of data written, read or verified by commands from the host system. 5 MTTF (Mean Time to Failure) is not a guarantee or estimate of product life; it is a statistical value related to mean failure rates for a large number of products which may not accurately reflect actual operation. Actual operating life of the product may be different from the MTTF.